Sasha Berger is a Program Manager at NACTO. In this role, she leads the programming and execution of the annual Designing Cities conference, convening over 900 transportation professionals to raise the practice of urban transportation planning and policy, and strengthening the movement of sustainable transportation practitioners across North America. Sasha also launched, curates, and manages the NACTO webinar series, providing free cutting edge peer-to-peer learning opportunities to thousands of city transportation professionals each year. She also supports the programming and logistics for Leadership NACTO, a leadership development fellowship for city transportation officials. 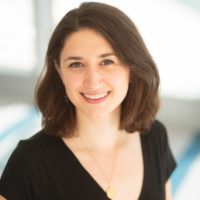 Prior to joining NACTO, Sasha worked as an Environmental Consultant and GIS Analyst for the Washington University Interdisciplinary Environmental Law Clinic, directed an undergraduate program on city cycling and urban gardening in St. Louis, and fought plaintiff-side employment discrimination matters at Wigdor, LLP in New York City. In 2017, she was selected as an Emerging Leader in Transportation by the NYU Rudin Center for Transportation. Sasha is passionate about ensuring that transportation networks and policies expand social and environmental justice in cities. Sasha holds a BA from Washington University in St. Louis in Anthropology with a concentration in Global Health and Environment.